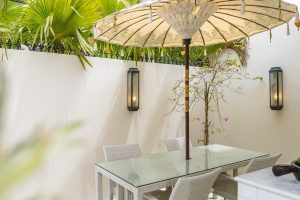 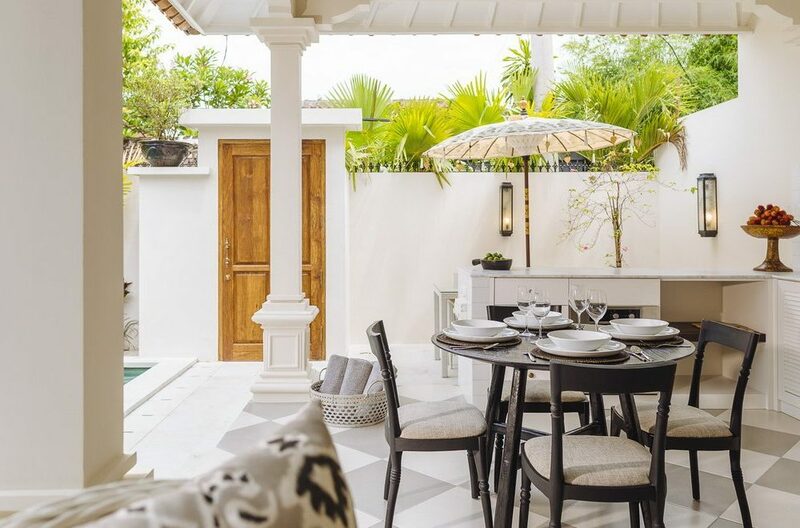 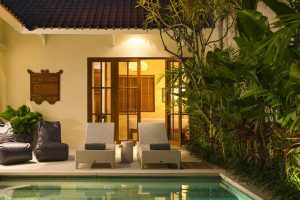 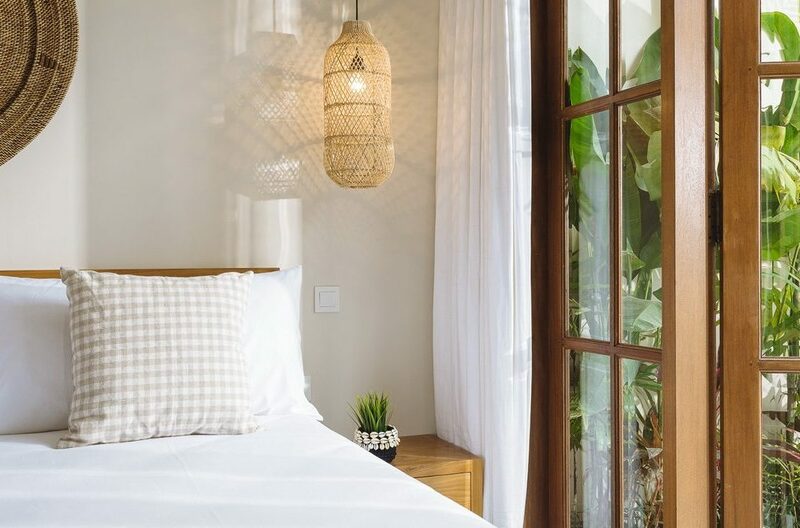 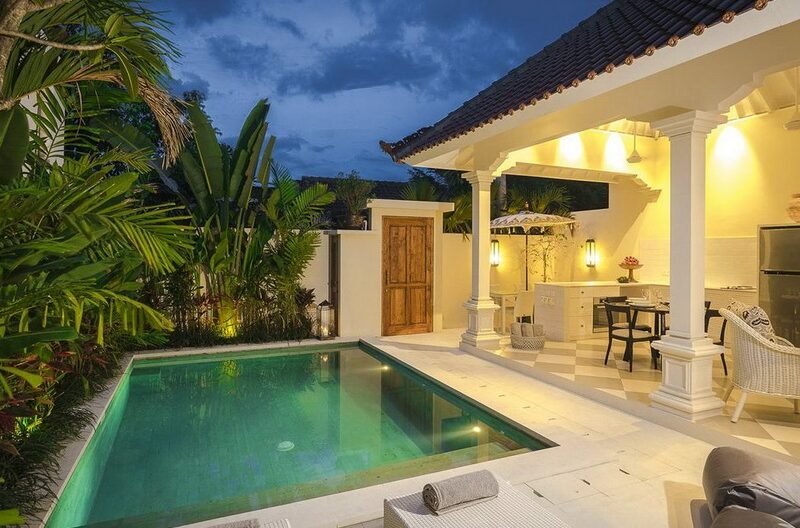 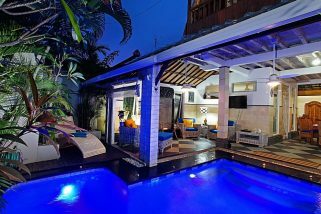 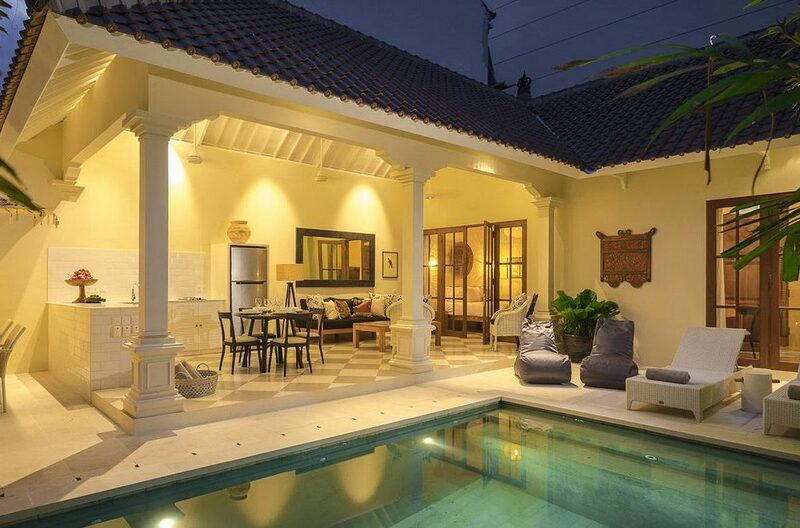 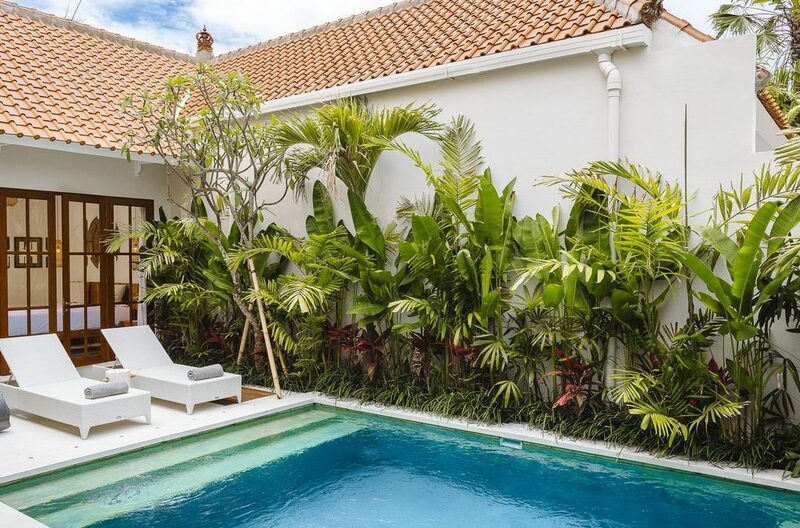 Looking for a lovely 2 bedroom villa holiday rental right at Seminyak Square, in the heart of bustling Seminyak for 4 guests? 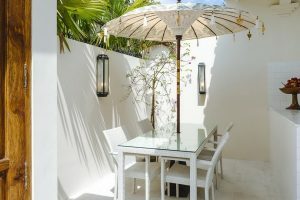 Look no further, the brand new Villa Puri Pani has a private pool, stylish furnishings and amenities, friendly villa staff, open-air tropical poolside living, air-conditioned bedrooms and an amazing location from which you can walk to the beach in front of Ku de ta Beach Club or La Lucciola seafront restaurant within a leisurely 5-10min stroll. 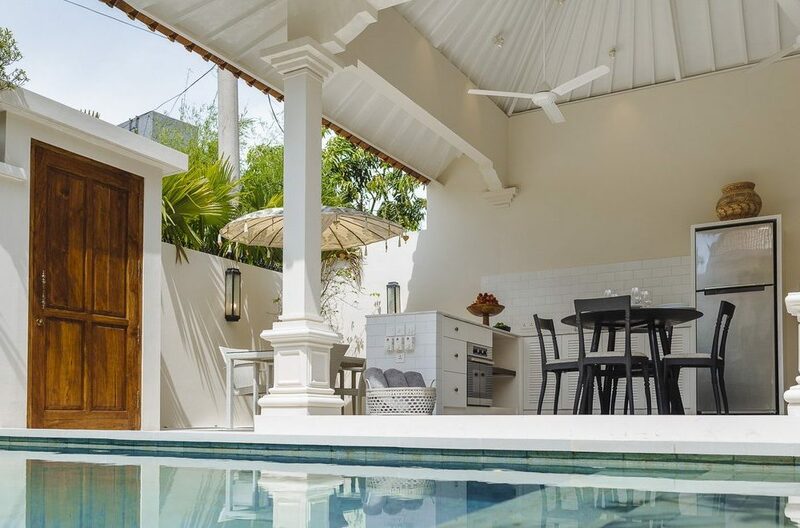 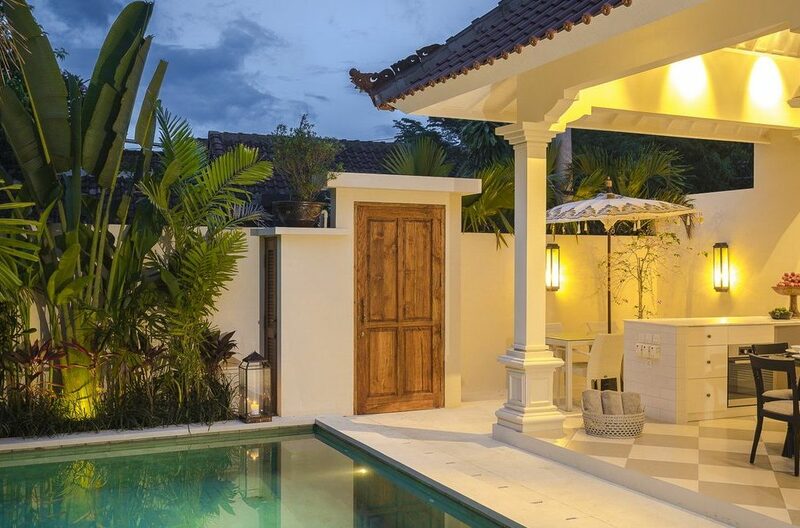 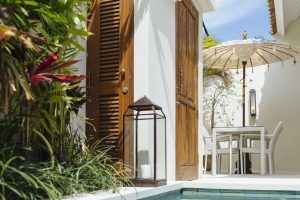 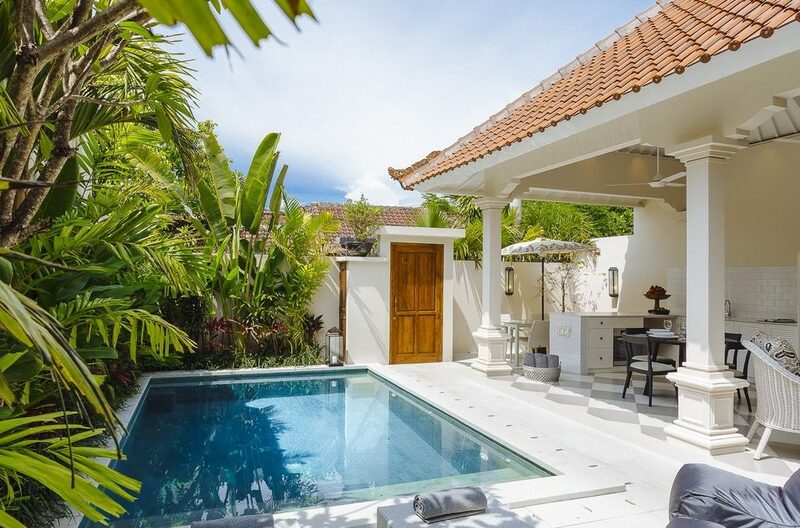 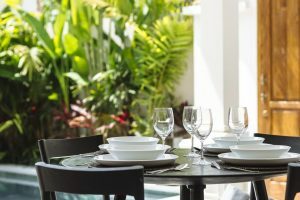 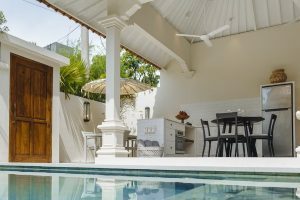 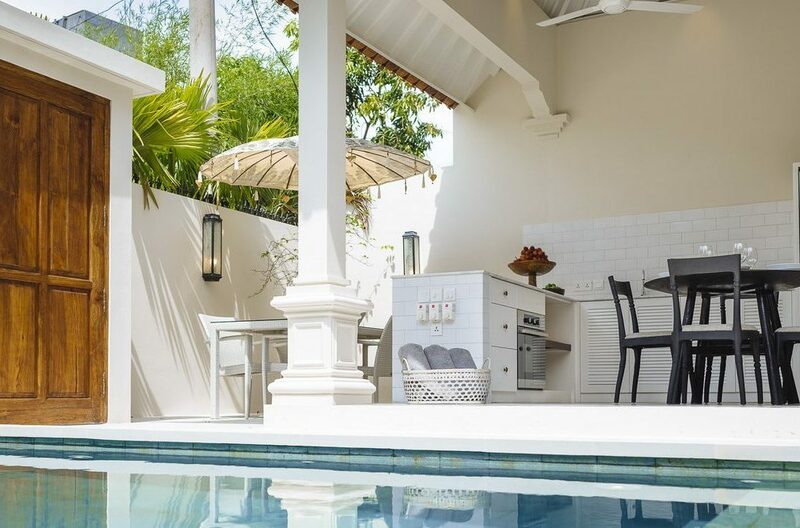 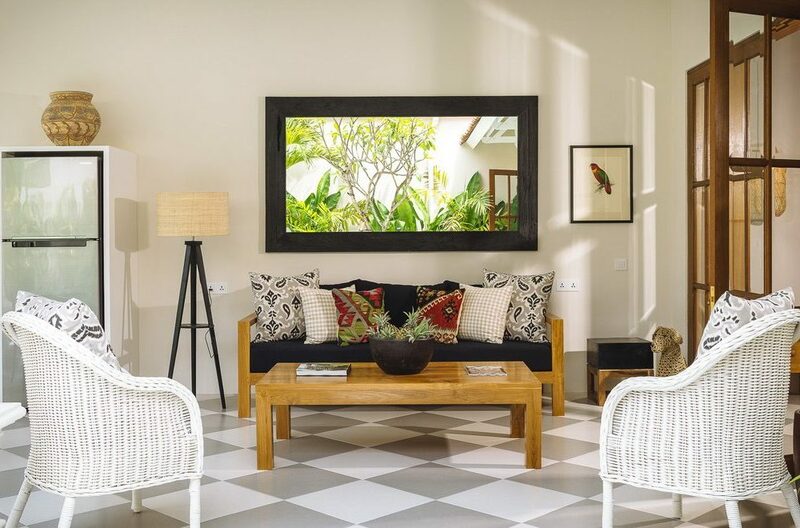 Upon entering the villa you are sure to be impressed by the villas stylish décor and cozy courtyard styled outdoor setting with a 6 metre private pool, perfect to cool down after lots of shopping and exploring of the local area including the beach as well. 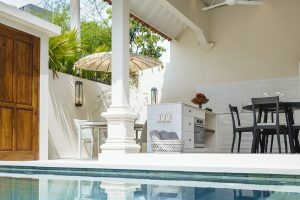 Flop into a poolside beanbag or throw the towel over a recliner under the parasol, the water is refreshing and crystal clear. 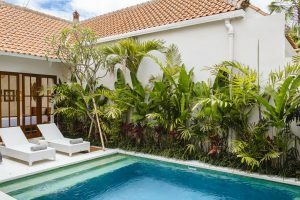 There’s lots of tropical foliage on the far side of the pool and high white walls, affords every privacy for friends and family. Right by the pool is the open-air living quarters consisting of a sleek kitchen with complete cooking facilities, al-fresco & semi-formal dining tables, a lounge area with white rattan arm chairs and comfy sofa and ceiling fans to keep the climate just right. 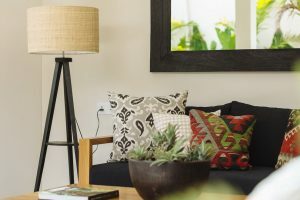 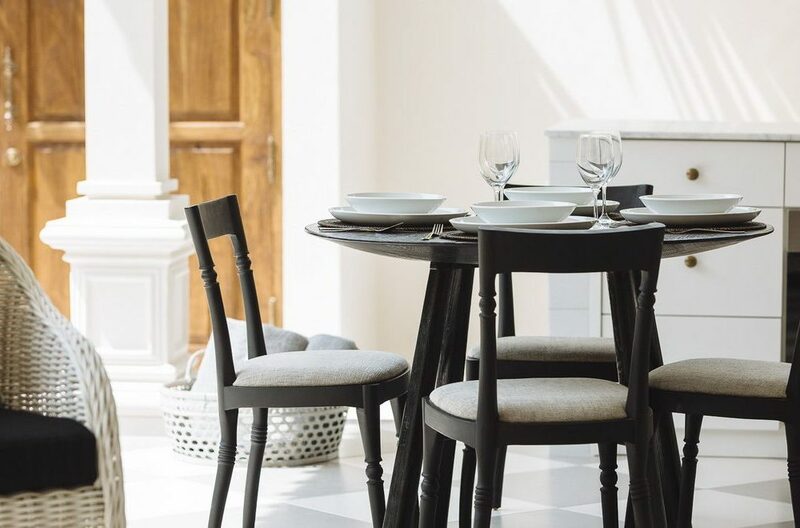 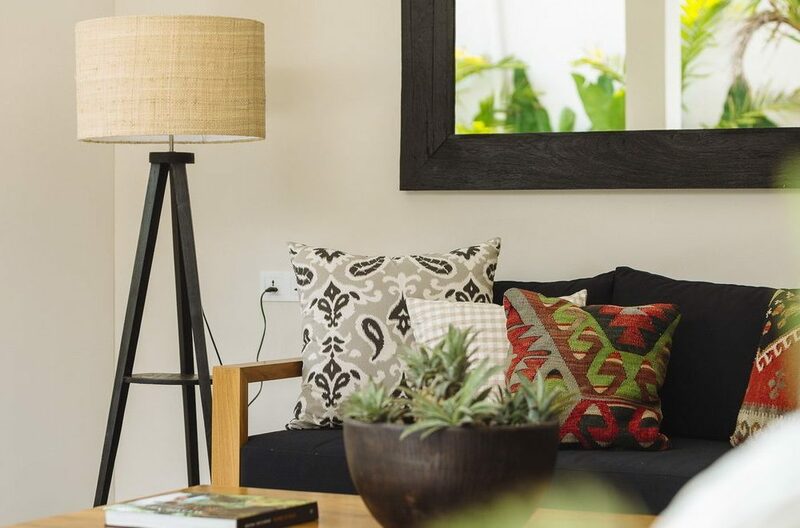 The space is bright and airy, highlighted by lovely artworks, ornaments and furnishings, from here you can take in the tropical ambience as living spaces morph into outdoor tropical living. 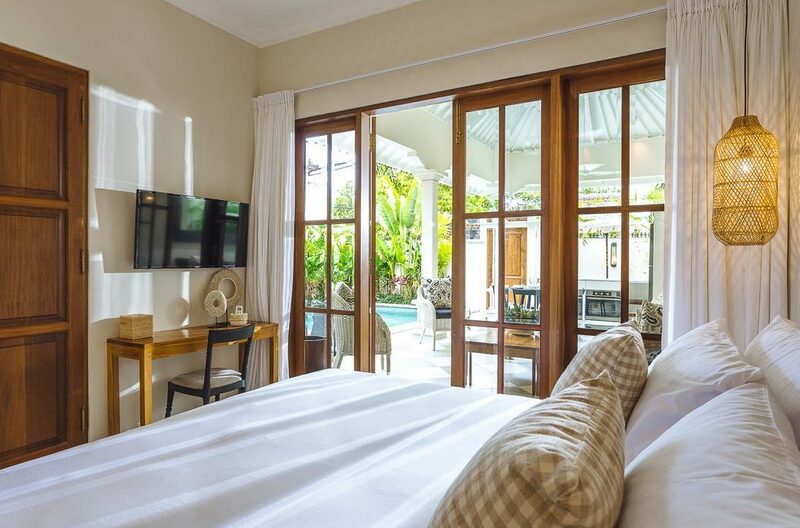 The villa boasts fibre optic Wi-Fi and a smart phone is provided so you can contact the villa staff 24 hours a day. 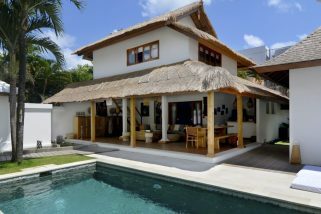 The villa sleeps up to 4 guests in two King sized bedroom suites with private en-suites attached. One of the rooms allows for twin single bed configuration, both air-conditioned with flat-screen TV’s for evening entertainment. 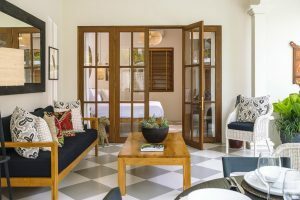 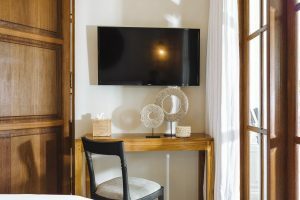 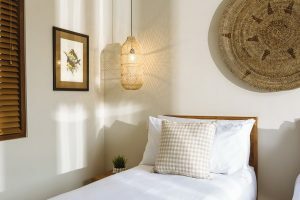 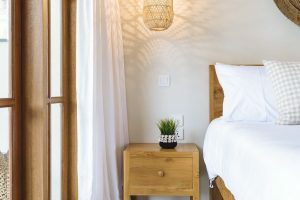 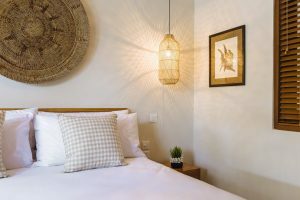 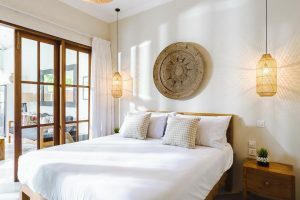 Beds feature pristine white linens, teak timbered French doors open onto the pool and living areas, chic wall furnishings and lamp shades make the rooms very attractive. 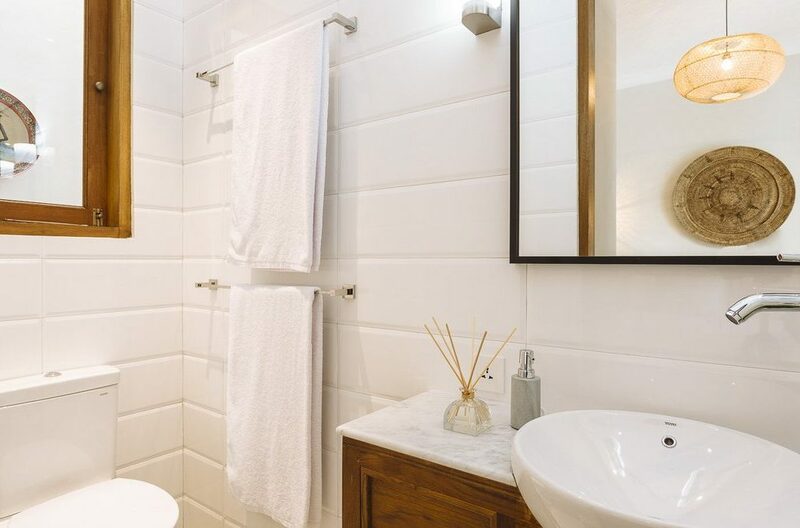 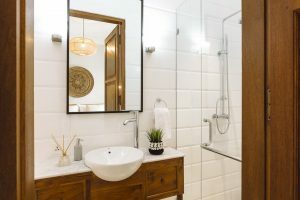 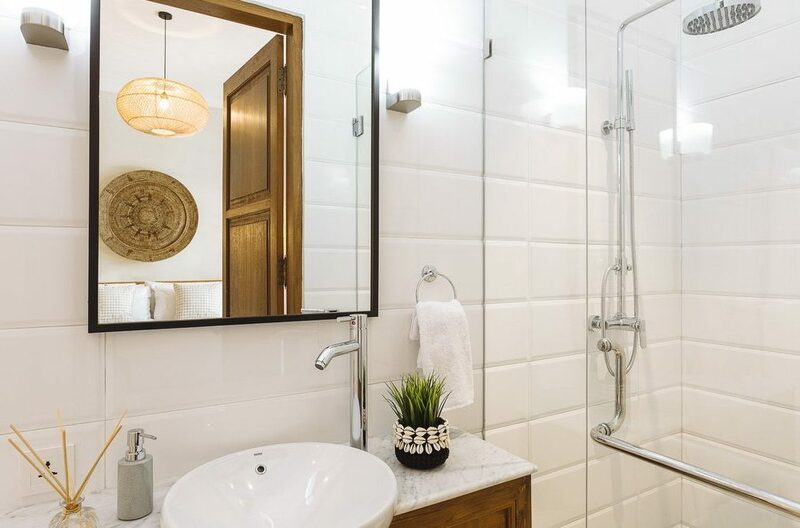 In the private en-suites, white granite sits on lovely teak timbers and the rain shower stall are spacious. 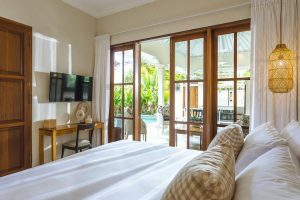 The villas manager will greet you upon arrival making sure you settle in quickly, a smart phone is provided for 24-hour contact. 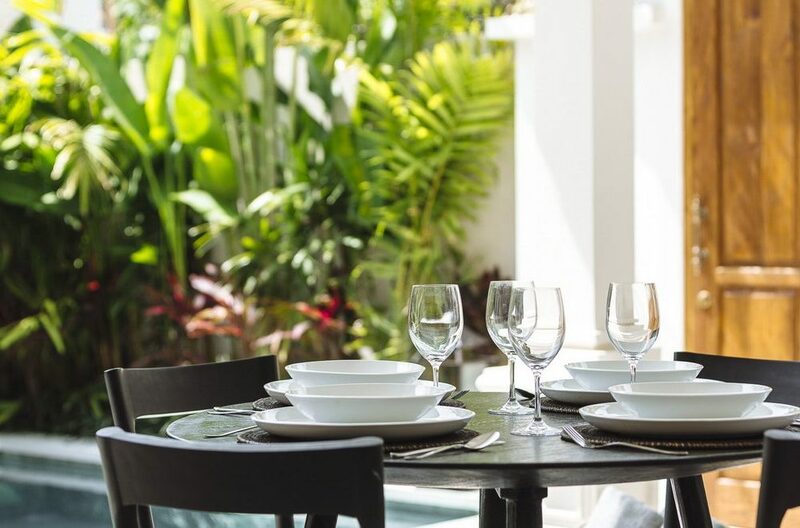 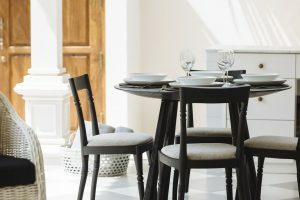 The villa will be cleaned daily and breakfast served at a time you prefer each day. 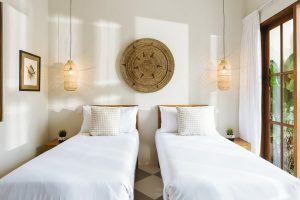 The staff will happily assist with bookings and reservations along with additional services. 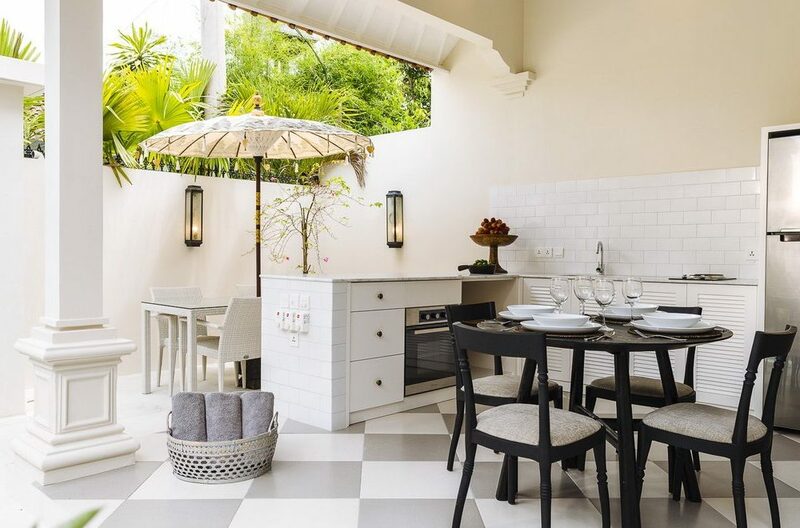 Once you walk out the door of your villa you are right in the middle of the action, the villa is located right next to the new Seminyak Village shopping centre, skip across the road to the very popular Sisterfields or Grocer & Grind, both excellent for breakfast, lunch and dinner. 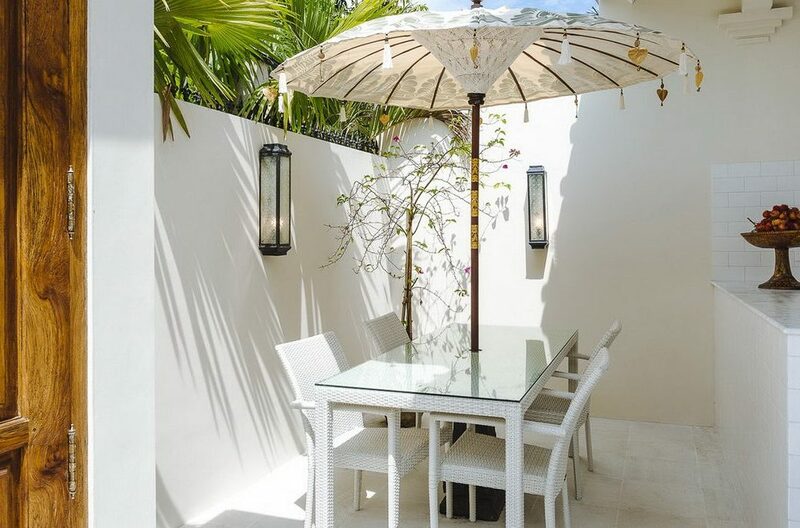 Seminyak Square also offers a great selection of restaurants, the Adrenalin Sports Bar, ATM’s and a top quality supermarket with wine and spirits. 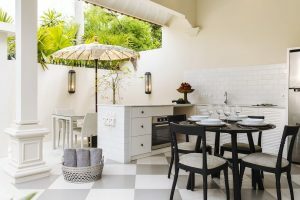 You can walk to the beach within 5-10 mins in front of the Petitenget Temple past Motel Mexicola or in front of the iconic Ku de ta Beach Club; this is the “A1 Seminyak location”!!! 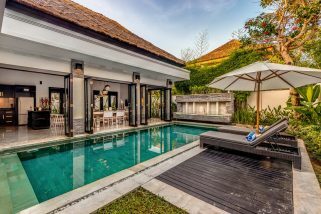 To view other Seminyak villas near Eat Street or our full range of 2 bedroom Bali villas that are ideal for a family holiday please browse this website or contact our reservation team. 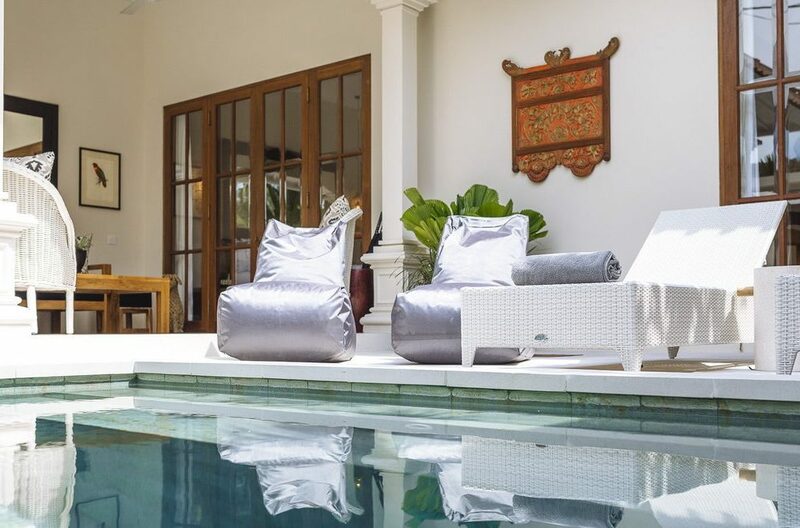 This is a popular Seminyak villa so if your planning a trip to Bali, especially during the Australian school or public holidays please book Villa Puri Pani well in advance.